Emma Jane Donald, a contemporary jeweller from Melbourne, recently invited me to her home studio to talk about her latest work and inspiration. The very fun interview was helped along by George her lively puppy and some great gluten free ginger cookies. Thanks Emma Jane! Tell me about your background and what led you to jewellery design? It started at high school where I studied sculpture and art subjects. I studied sculpture as part of a Fine Arts degree at Elam, the Auckland University Art School in New Zealand. I specialised in sculpture, but not in a traditional sculptural way, more about installation and performance. My interest in jewellery really began when I moved to Australia and met William Griffiths, a New Zealand jeweller making in Melbourne. He said to me, come and see if you like making jewellery and hang out. I hadn’t really thought about jewellery until I met him. I ended up just mucking around in his studio making my own things. My first piece was something really instant – a safety pin pressed into cuttlefish with molten metal poured into it. I was chuffed, and thought ‘this is the best thing ever!’ I felt quite inspired by William’s work and I enjoyed working with him so much that I decided to study Jewellery Engineering at NMIT. How would you describe your work? I’m inspired by geometric patterns, formations, structures and architecture. I think I started doing angular, sharp work because I wanted to test myself technically. Geometric shapes can be trickier than making round organic shapes. Because my course was a trade course, we made hinges and very precise things. I wanted to prove that I could do those technical objects and now I have ended up doing hinges in my work. The NMIT course is so different to the RMIT course. It’s a trade focused course, for instance we would spend 3 weeks making hinges. I chose the course for that reason. I had already done fine arts degree so I wanted to just get down and get some skills. What common themes link each of your designs? I suppose it’s the whole geometric thing, similarities of the forms. I’m trying to incorporate spheres into my work so it’s not all sharp and aggressive. It’s tricky to make the angular stuff spherical, especially with the geodesic shapes. I want to start using more stones but at the moment I work just with metal. Is your creative process ordered or organic? Ordered. I’m not organic at all. Making a cone or dome becomes a personal challenge, then I will start joining them together to make a necklace, bracelet or pendant. Quite often I will make something that starts off as one shape, like a geometric shape, then I will start multiplying the shape to become much larger. When you start a piece do you think ‘this is going to be a necklace’ or does it evolve? Sometimes it’s pretty definite – at the moment I’m trying to make smaller pieces. I find it harder to make smaller pieces. Even though I make geometric shapes, I’m pretty rough and ready. Once I have an idea I want to get it out! Do you work alone or do you share your creative space? I work alone. It means I can work more effectively when I want to. It can get a bit lonely. Sometimes you can wear your pyjamas all day and not leave the house. How do you stay connected to the wider creative community in Melbourne and internationally? The Internet, I go to exhibitions and I’m friends with a few Melbourne jewellers – William Griffiths and Julia de Ville and Katherine Bowman. Internationally, I don’t have much of a connection with New Zealand jewellers because I didn’t make jewellery there. I’m just as much interested in video art, noise and sound. It informs my jewellery work. A little while ago I saw this work in an architectural magazine that was big, black and folded, and I liked it. Sometimes it comes from other sources. It doesn’t have to be in your field. Sometimes it’s just a really good song. I’m really into Siouxsie and the Banshees at the moment. I listen to music when I work, otherwise it’s quite boring, especially when you are by yourself. Once I have an idea I might cut out the music, or if I am having trouble working out something mathematical. When I’m doing production stuff, the louder the better!! Where do you find your creative inspiration? It’s haphazard. If I did know where to go for inspiration, that would be awesome! I would go straight there. I think it just happens in bouts. I have bouts of heaps of inspiration and will just flow on from there and hopefully ride the wave until I get another bout. Which designers, artists or creative people do you admire? I definitely like Buckminster Fuller, he’s awesome. I love the way he builds with geometric shapes. It draws on nature and cellular growth, how things are reproduced in life. Using multiples of geometric shapes to make a mass. Simon Cottrell is another favourite – I really like the way his work is constructed. His pieces seem to grow in an organic pattern, while still retaining an affiliation with the materials he uses. I like the juxtaposition of hard clean materials and the softer rhythmic references in his work. What would be your dream project? I would like to make jewellery for the Pope. You could make some really awesome geometric crosses with heaps of jewels and gold. Everyone would see it! What do you enjoy outside of jewellery? I take my dog George for walks but that sounds quite boring! I like to go out and listen to music. Music is a big part of my life. My boyfriend is a sound engineer and he’s really into it. I think it can really change the way you feel about things, which is very cool. What advice would you give to emerging contemporary jewellery artists? When I first started I made really big pieces and perhaps should have started with smaller pieces. Big pieces are more time consuming and they don’t sell as often. Everyone does it differently, it’s just finding your own practice, finding your own style and discovering how it works for you. I know people who have completed a NEIS course, which sounds really good. Is it hard to switch hats between being a maker and running a small business? Yes! I’m not good at business but it’s all a learning process. It’s very easy when you are on a creative run and think ‘yeah I’m just going to go for this!’ but you know in the back of your head that it’s not commercial to make really big pieces. But as an artist, it’s really hard to put the idea away once you have had it. 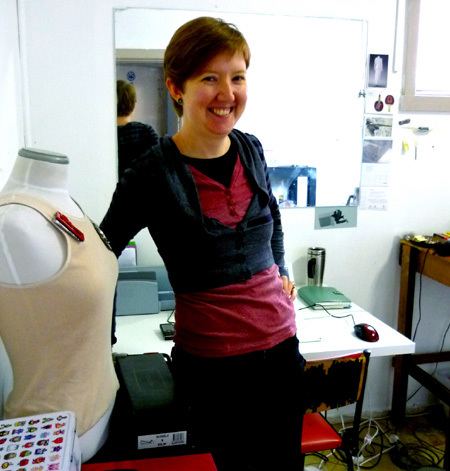 Visit e.g.etal at 167 Flinders Lane, Melbourne, to view Emma Jane Donald’s current collection.